If there is one person that fan girls of Japanese pop have to thank, it is Johnny Kitagawa. 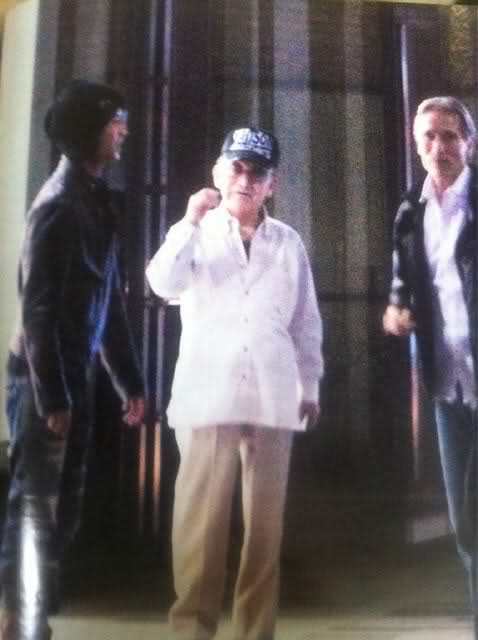 Without him, Japan wouldn’t have produced some of its most famous male idols like Kimura Takuya, Matsumoto Jun and Arashi through his Johnny & Associates. And now, even the Guinness World Records has officially acknowledged Kitagawa, or “Johnny-san” as he is known, as a “prolific idol band” producer. Guinness awarded Kitagawa new records for “Most No 1 Singles Produced by an Individual” (232) and “Most Concerts Produced by an Individual” (8,419). “Kitagawa has achieved the No 1 position more often than any music producer with a record 232 chart-toppers for over 40 of Japan’s bestselling groups (based on data for the period 1974 to 2010),” Guinness said on its website. “He also holds the record for the most number of concerts produced by an individual having produced an amazing 8,419 between 2000 and 2010,” it added. It noted that concerts by Japanese mega-bands SMAP, KinKi Kids, Arashi and KAT-TUN attracted an estimated 48,234,550 fans. “His achievements, over a career commencing in 1962, have earned him the reputation as the most prolific ‘idol band’ producer in the world,” Guiness said. The new records recognise Kitagawa’s influence in Japan’s pop culture, but he has not been without controversies. Over the years, Kitagawa has battled sexual harassment accusations and has even sued weekly newspaper Shukan Bunshun that printed a 10-part series in 1999 quoting a dozen teenage boys accusing him of sexual harassment. The company said the claims were made by disgruntled former employees. Kitagawa’s policy to only train boys has also raised eyebrows but the impresario said previously that it was easier to train boys than girls who usually have a lot of dramas. Kitagawa’s first recruit was a group of boys playing basketball that he encountered during a walk through Tokyo’s Yoyogi Park soon after he returned to Japan from the United States in the early 1960s. Kitagawa, who was born and raised in California, gave the group the name “The Johnnies”. It was successful mainly due to the novelty of having good-looking performers singing and dancing to catchy music. Suffice to say, The Johnnies was the first all-male pop group in Japan and to this day, the term “Johnnies” applies to those male stars under Kitagawa’s management. Perhaps Kitagawa’s biggest success story is SMAP, which debuted in 1991, and would have fallen to oblivion had they not done a TV show that boosted their popularity. In addition, one of the members, Kimura Takuya, started doing dramas and became immensely popular. Kimura’s popularity pulled SMAP up and they soon became Japan’s top male group. To this day, the group remains the top endorsers among male stars and even Japanese ambassadors, performing in Beijing for the first time earlier this month. Another male group under Johnny’s, Arashi, follows a similar route as SMAP. They also debuted successfully but their succeeding singles did not do well as expected. Then Arashi started doing a TV show and one of its members, Matsumoto Jun, did Hana Yori Dango that was based on a famous manga. History repeated itself with Arashi’s popularity soaring not only in Japan but across the region. Proof of this is their “Arashi Around Asia” concert tour in 2006, with stops in Taipei, Seoul and Shanghai. Johnny & Associates continues to produce male idols, with boys as young as seven sending applications to the company in hopes that they would be called in for auditions. These aspiring idols usually start through Johnny’s Juniors that do back-up dancing for their seniors as part of their training. This is how the members of Arashi, KAT-TUN and Hey! Say! JUMP started. Just this month, the company debuted ABC-xyZ. 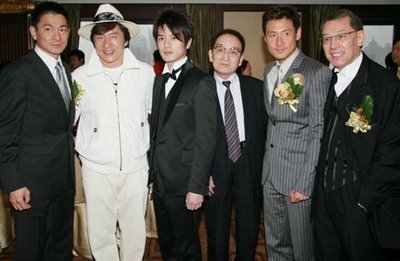 (L-R) Andy Lau, Jackie Chan, Tackey, Johnny Kitagawa, Jackie Cheung and Alberty Yeung. Indeed, it seems that even at 80 years old, Kitagawa is not about to stop from producing the next generation of male idols. However, it has been highly speculated on who will take over from him once he retires, if he has plans at all. And just as the personal lives of his talents are tightly controlled, there is also little known about Kitagawa himself outside his work as leading impresario. There are of course bizarre news every now and then like when a man broke into his apartment in Shibuya last month. It is perhaps the absence of Kitagawa’s public persona that has prompted many parodies of him, including a mock Twitter account. It’s even hard to find a photo of Kitagawa himself, just like how he prohibits the use of photos of his talents without the company’s permission. In fact, if the rumours are to be believed, nothing ever happens in his talents’ lives without the old man’s permission at all. That may be one of the secrets to his success. Eek, parang dictator. paano nakapag-asawa yung mga alaga nya? there’s a rumor that says only one member per group can get married. look at SMAP. and Tokio I think. Johnny-san is known for his high-handed ways in dealing with generally everyone. Companies are scared to get his ire coz that means he won’t let his talents, the most famous in Japan, work for them. and of course you know that until recently, the pictures of his talents in their drama websites were all cartoon or whatever coz he didn’t allow anyone to use the real photos.